If you’re seeking fresh inspiration for your SEO copywriting try tapping into techniques used by content marketers. Like SEO, Content Marketing is a potent form of business marketing. It specifically involves creating relevant, useful information to attract and maintain a clearly defined target audience. It is not an overt sales pitch like a traditional advertisement but aims to raise a company’s profile by providing prospects and customers with intelligent information on a particular subject. A series of blog posts by a maintenance company on how to carry out simple DIY repairs, such as fixing cracks in walls and ceilings. An article on how to spot the early signs of Dyslexia in children by a special educational needs school. A podcast from a tech services company about the benefits of cloud computing. By making interesting, information-rich guidance widely available to searchers online, content marketing helps to subtly demonstrate a company’s expertise and authority in their field, thus making prospects and customers more likely to do business with them in the future. 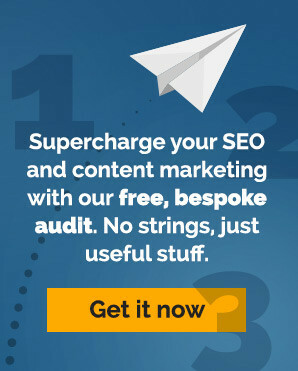 The great thing about content marketing is that it is a completely scalable marketing technique. So if you are a sole enterprise you have the same opportunities to create engaging online marketing content and authority links as a globally recognised company. So how can an SEO copywriter benefit from thinking like a content marketer? Well there are several ways. Much like an SEO copywriter must constantly mine for new ideas and angles which will excite and engage prospects and customers, so do content marketers. Search Engine Journal’s recent post suggests using social media networks for content marketing inspiration. For example, reading blogs and articles that your social followers are sharing on Twitter, or checking sound bites and opinion pieces from industry leaders that are receiving comments from your target audience. Although these sources are highlighted for content marketers, these are just as useful for an SEO copywriter looking for topics making waves in a certain industry. Developing interesting, expert-led content is essential for successful content marketing and the same principle applies to effective SEO copywriting. In a busy online world where information vies for the reader’s attention, the person who provides the most enticing, intriguing title and description wins. ‘The death of the white wedding’ – a headline article on how brides are shunning white weddings in favour of colourful dresses by 3M, the Post-it note manufacturer. ‘The mankini beach body plan’ – an article highlighting how half of men embark on a diet before their holidays by Withings scales. Insurance tips for students’ belongings by insurer Endsleigh. If you’re an SEO copywriter faced with a boring subject, brainstorm alternative angles that will make a connection with your audience. Even better, if you have unique statistics or research, use it to support an interesting, newsworthy angle. Both SEO copywriters and content marketers want the reader to do something. For content marketers, it is simply to absorb the information and company name (one of the reasons content marketing is successful is because people have become immune to traditional forms of advertising) whilst an SEO copywriter’s end goal is to convert the reader, either into a subscriber or potential buyer. Before starting your content, have a clear plan in mind of what you want the reader to do. Craft your writing towards this end goal providing clear, concise instructions of what you want them to do next. As an SEO copywriter you can pick up valuable, practical techniques from how content marketers operate. For regular tips sign up to some of the Content Marketing Institute’s top blogs.